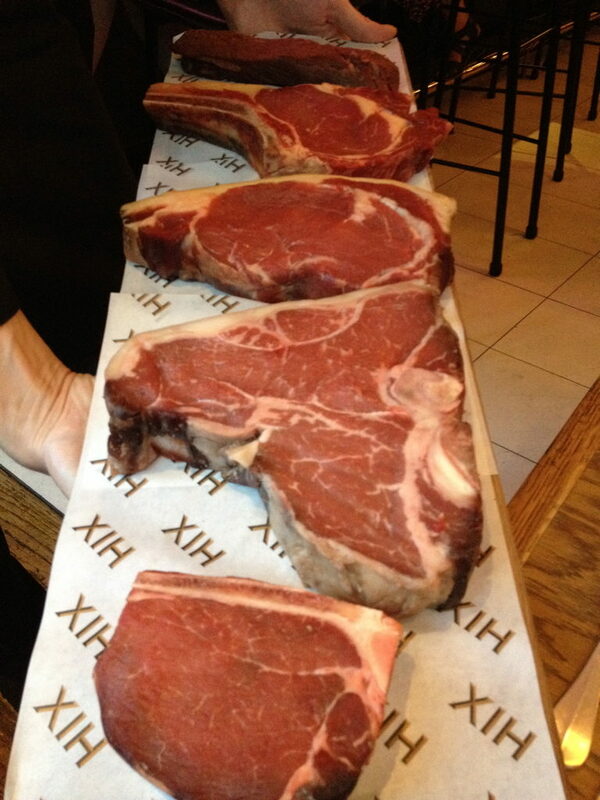 HIX Soho is Mark Hix’s second venture to HIX Oyster & Chop House in Farringdon. 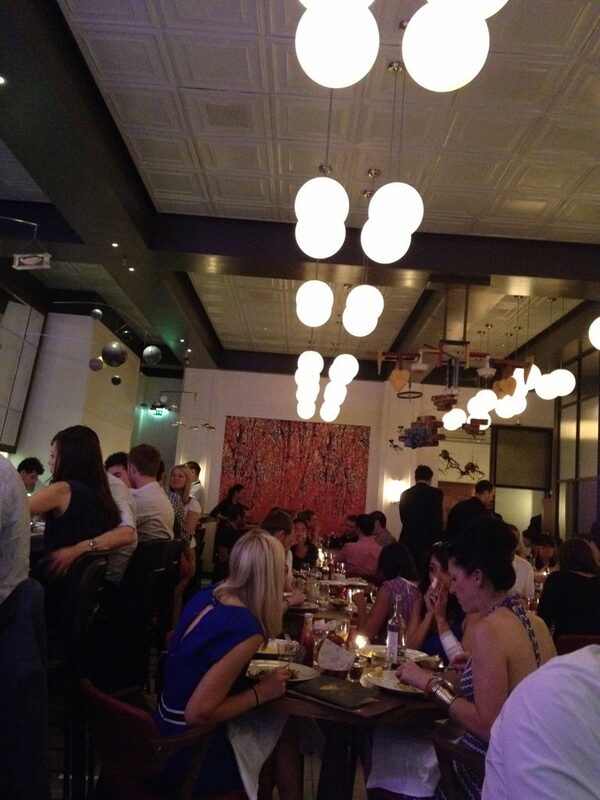 Shortly after it opened in 2009, they won London’s Time Out Award for Best New Restaurant in 2010. 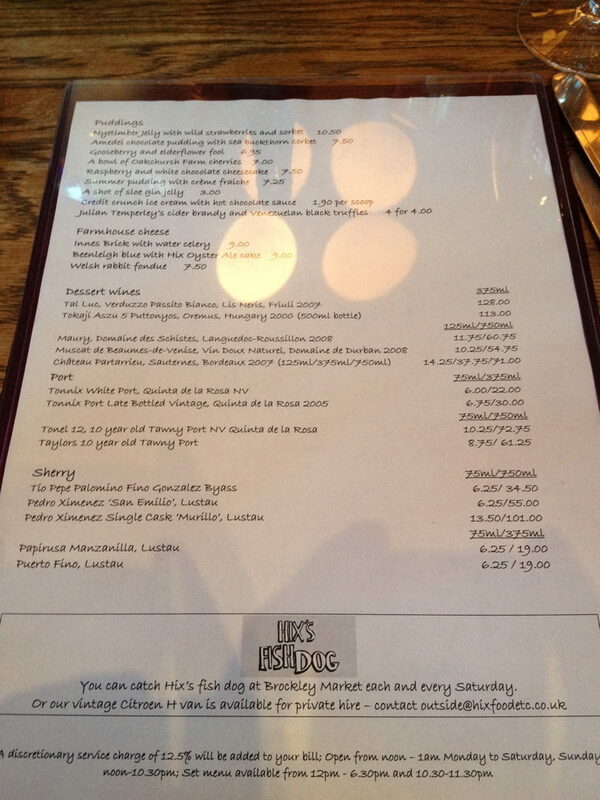 (Mark has since opened many other restaurants in London). 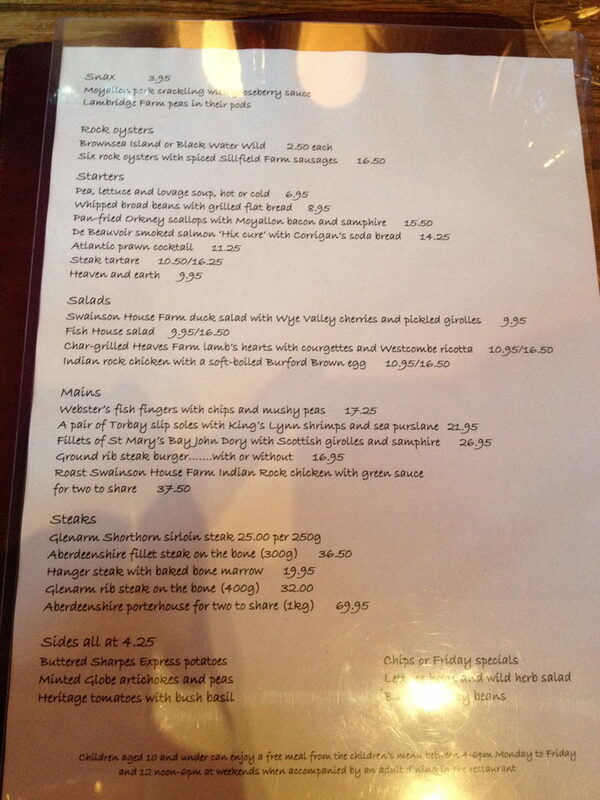 Prior to going solo, he ran kitchens at Le Caprice & The Ivy, so the chap comes with some serious credentials. The rooms come with walls bedecked with artwork from revered artists such as Mat Collishaw, Tracey Emin, the late Angus Fairhurst, Damien Hirst and Sarah Lucas. It’s the same downstairs “Mark’s Bar” where they hustle-up innovative cocktails and the classics too – they are open from midday there. 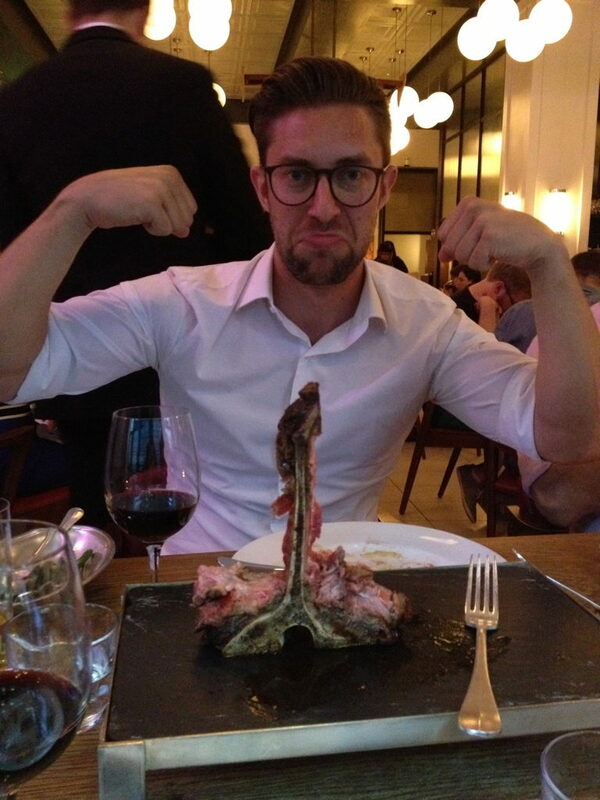 The place is a meat lovers paradise and these establishments generally attract the overtly male crowd, but from our visit it was quite the opposite! 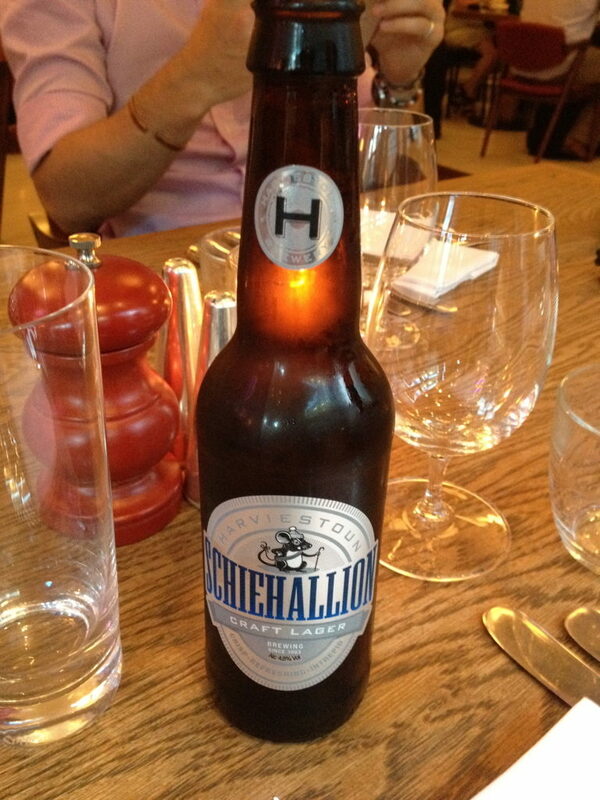 Jacketless evenings call for ice cold schiehallions £5. 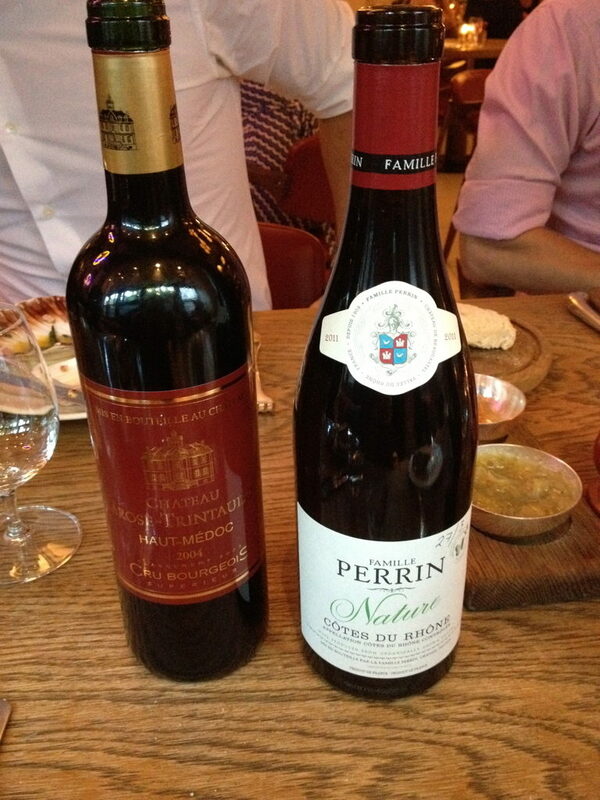 Chateau trintaudon £56.75 and Perrin Cotes du Rhone £36.50 was recommended to us as a dancing partners for the red meat fiesta ahead. 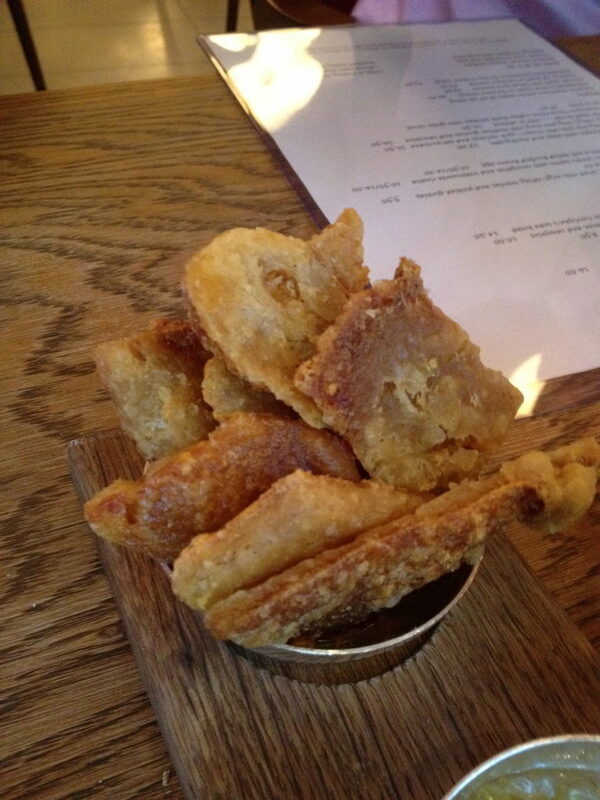 We started with waist thickening hunks moyallon pork scratchings £3.95. 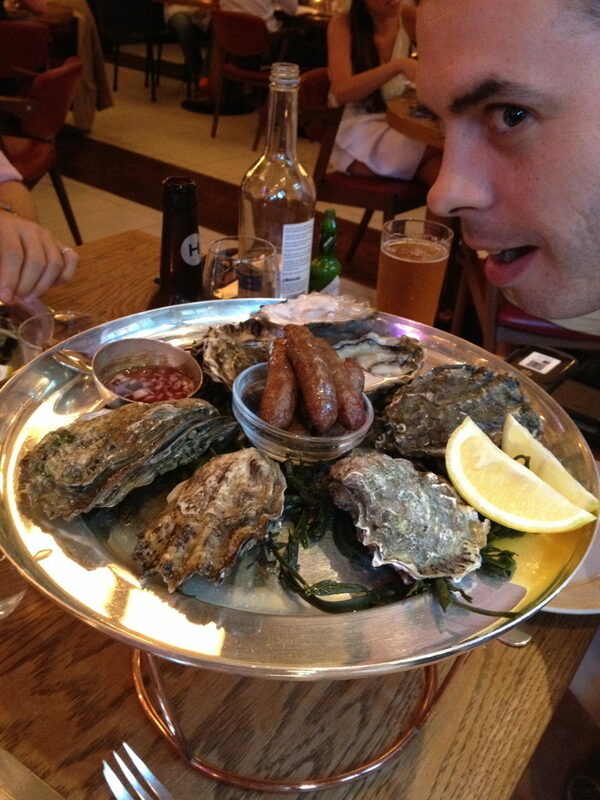 They were intensely greasy but satisfying for all of that. 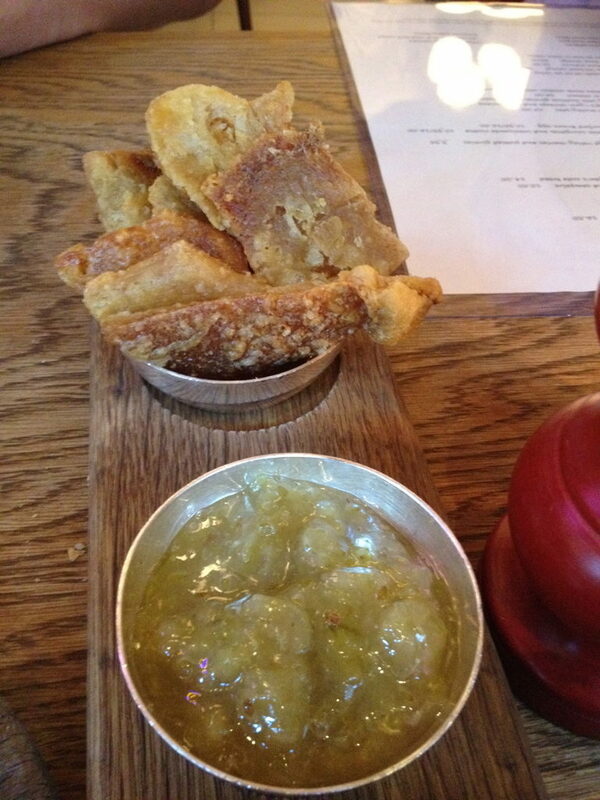 The gooseberry sauce added the much needed grease cutting element. 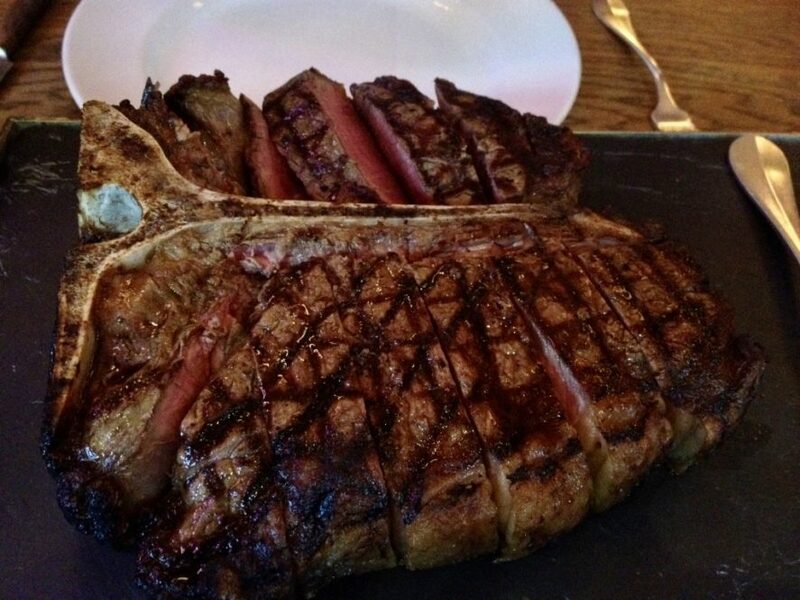 The meat is paraded, but why wouldn’t you want to show it off if it’s that good? 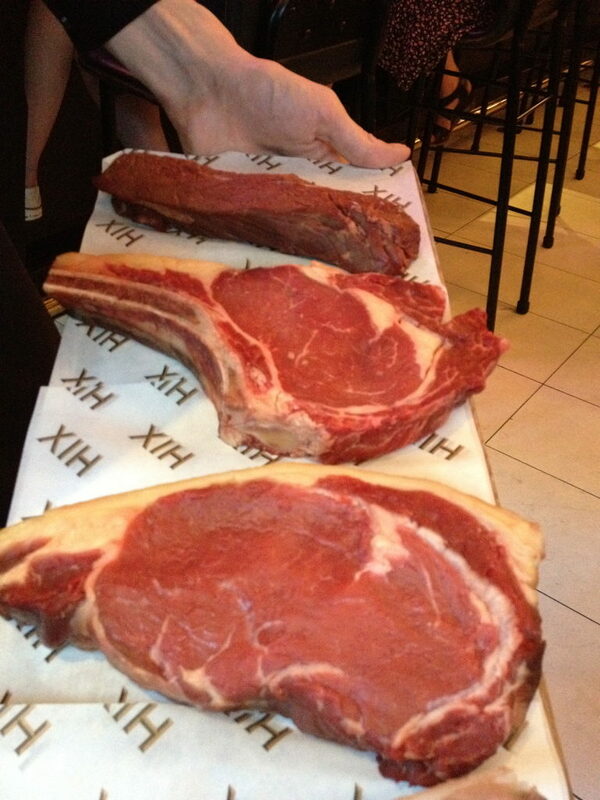 We were informed that all the beef is treated to spells of dry ageing. 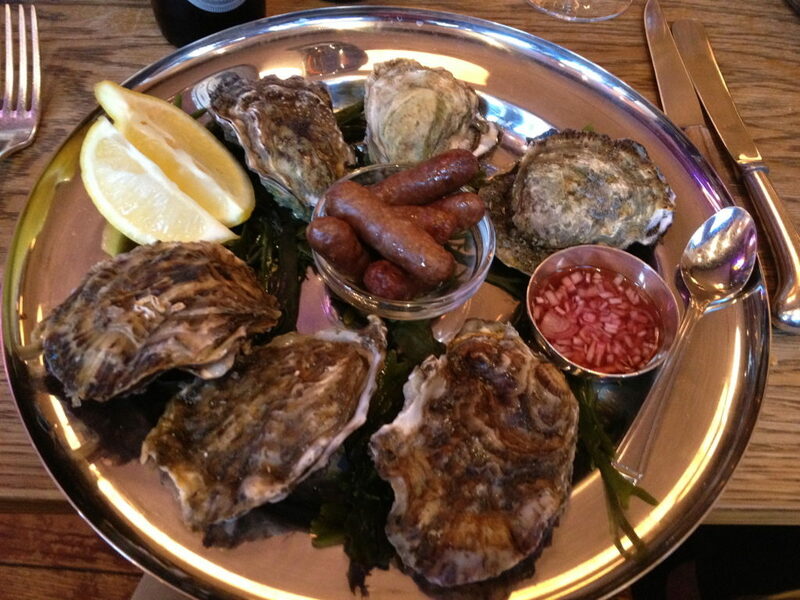 We start with 6 rock oysters with pinky sized spiced Sillfield Farm sausages £16.50. 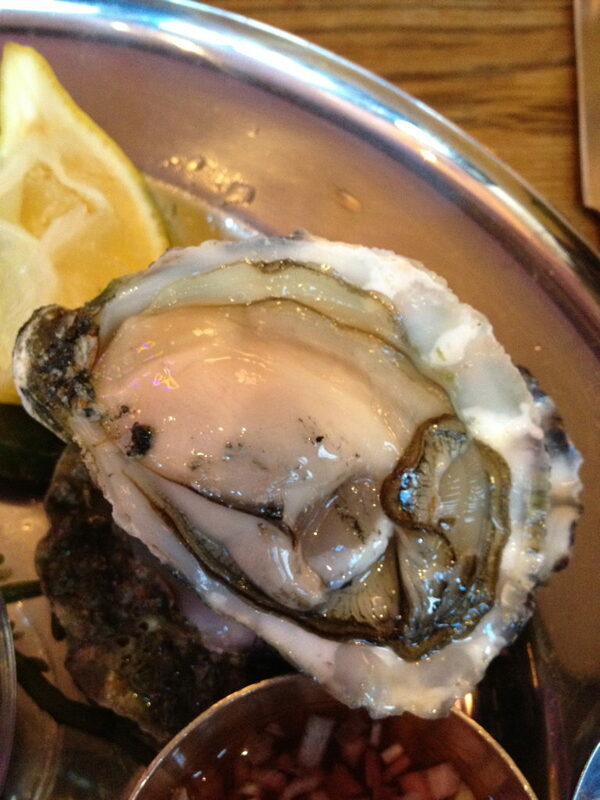 The latter was pleasant enough, but the plump-creamy oysters wallop you in the face with potent fishiness and I don’t mean in a pleasant way. 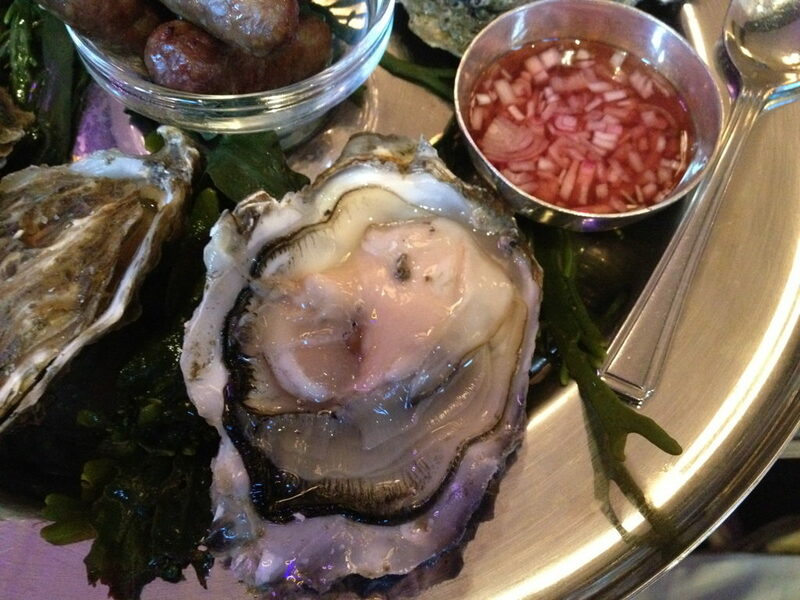 It was the first time my senses assaulted by a piece of shellfish. 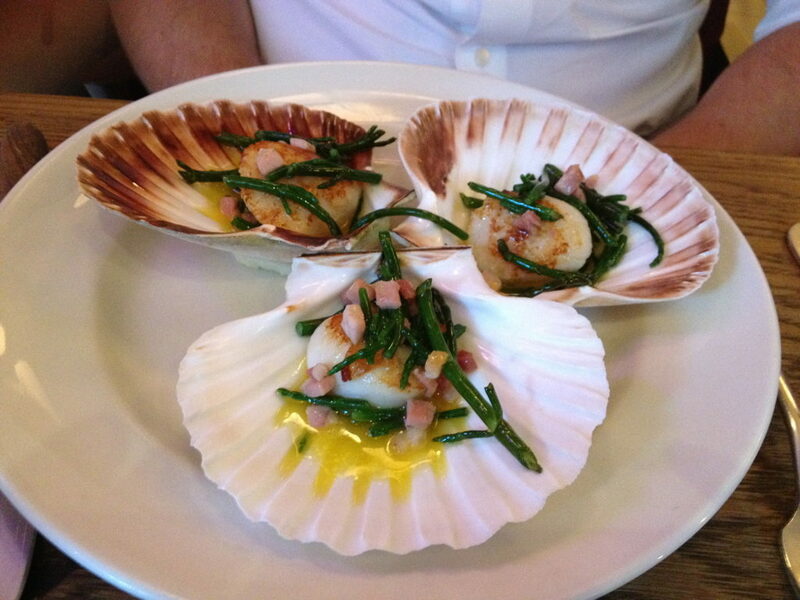 The smart diner got himself some pan fried Orkney scallops with moyallon bacon and samphire £15.50. 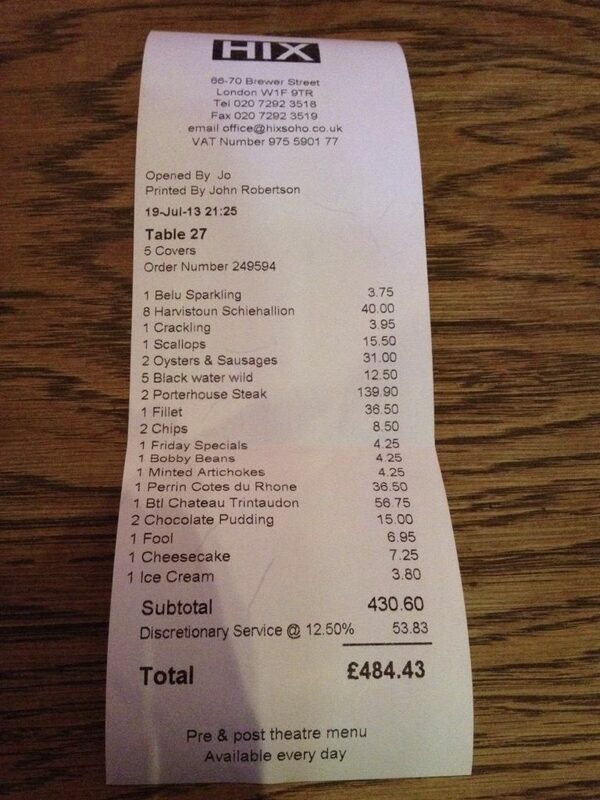 Naturally, we went for the 1kg Aberdeenshire porter house £69.95 to share amongst two. 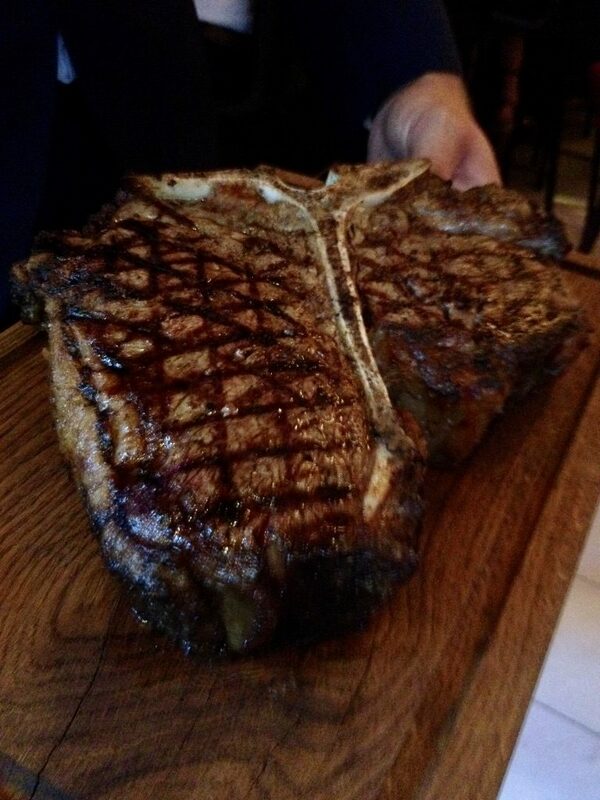 It’s entirely subjective of course, but some may argue that a hunk of sirloin and fillet is the way to go. On the night it just made sense and we didn’t regret a single minute of it. 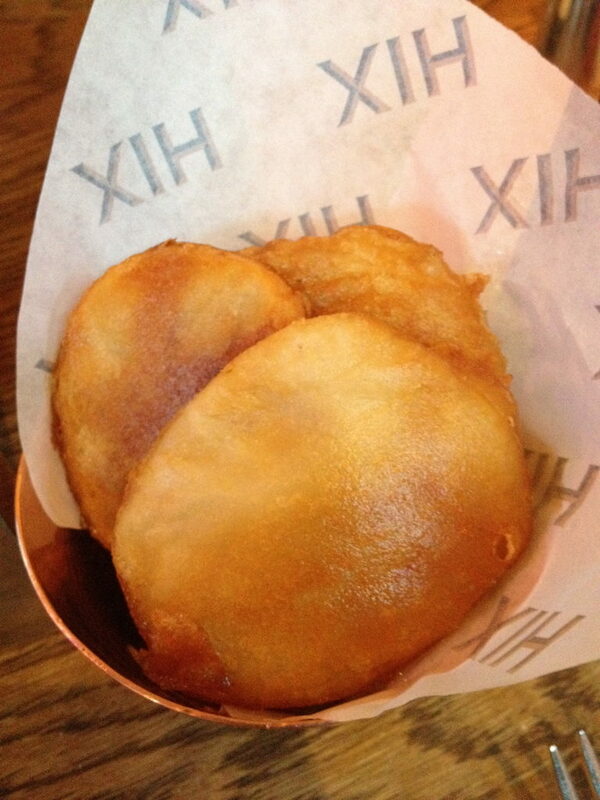 We also got discs of buttered Sharpes Express potatoes £4.25. 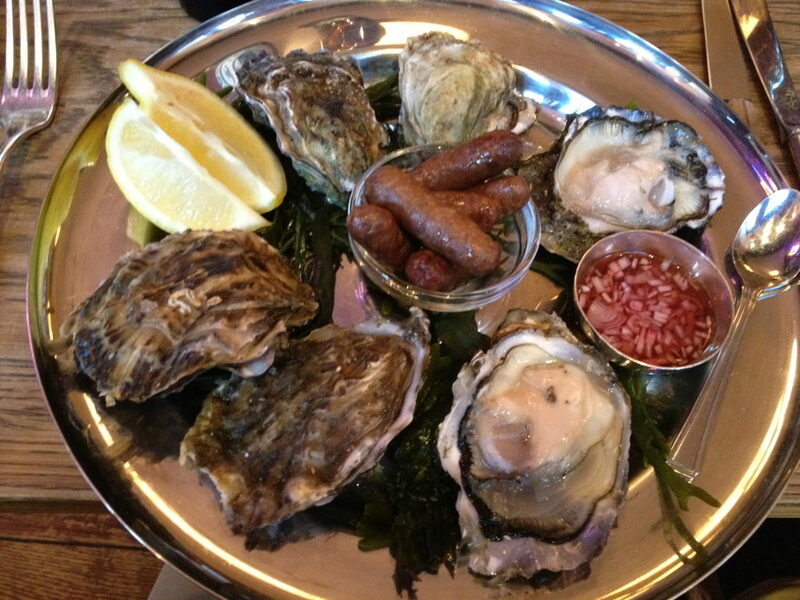 The golden brown hue and flavour was enough to suggest that they were probably deep fried in the butter! 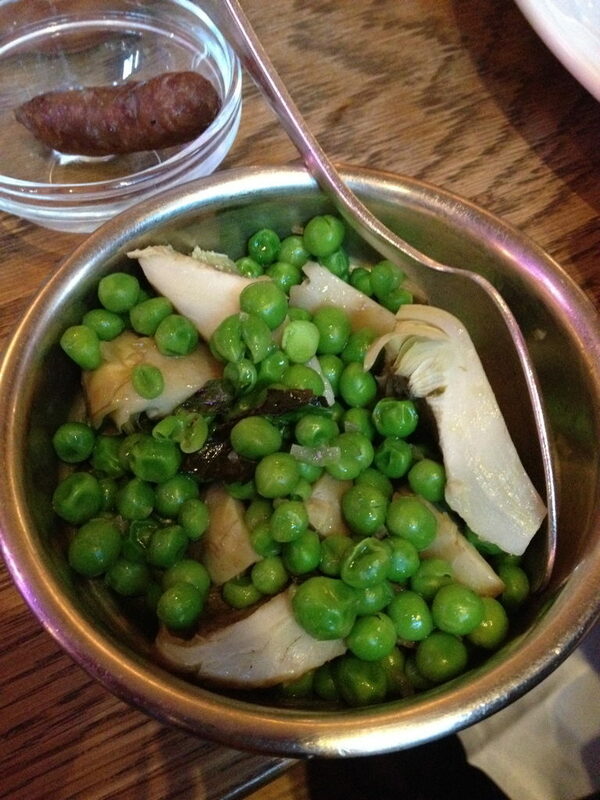 Minted globe artichoke and peas £4.25 was the much needed antidote to all the richness. 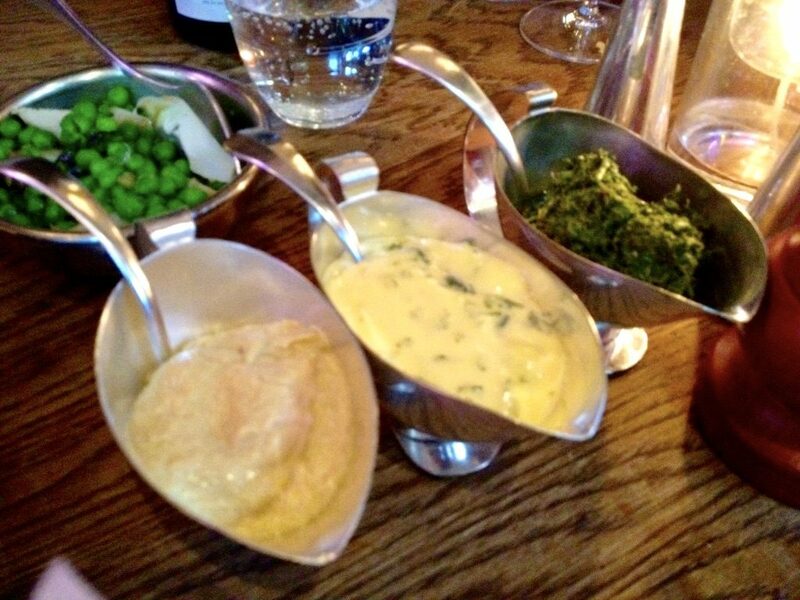 Condiments – mustard, hollandaise and creamed spinach. 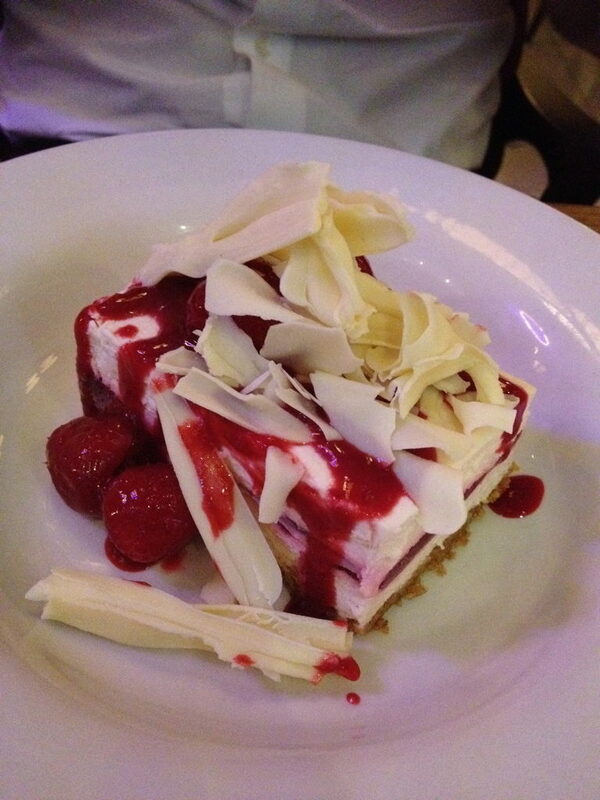 Raspberry and white chocolate cheesecake £7.50 was a delight. 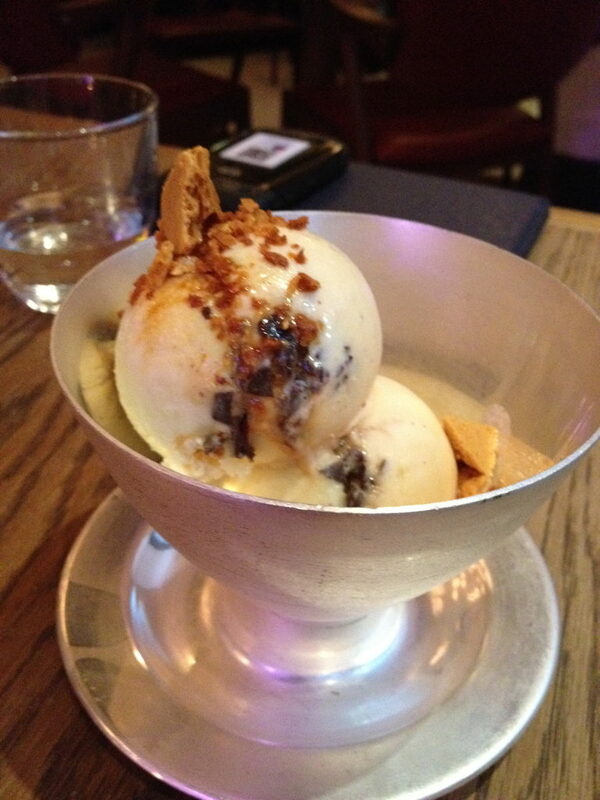 As indicated by the name, “credit crunch” ice cream £1.90 per a scoop had some lovely crunchy bits mingled into the richly set ice cream. 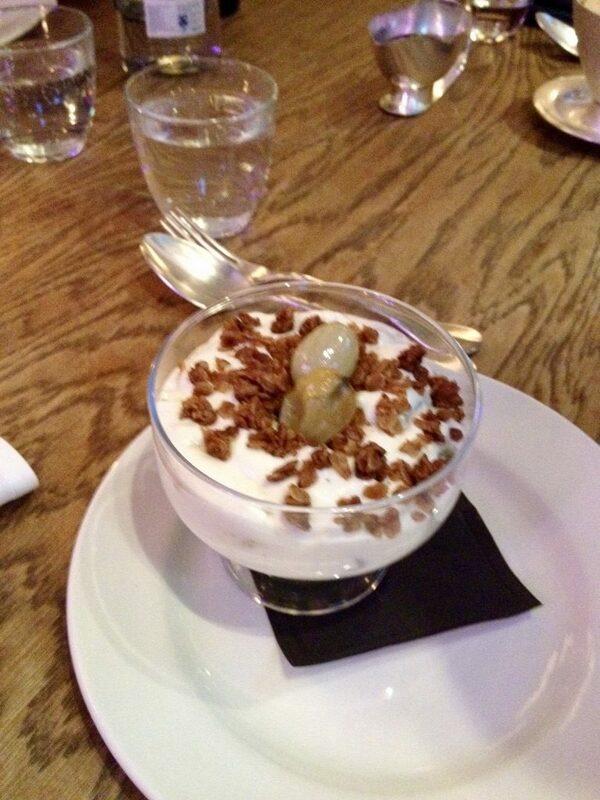 Gooseberry and elderflower fool £6.95 was the weakest link and didn’t deserve to join the party. 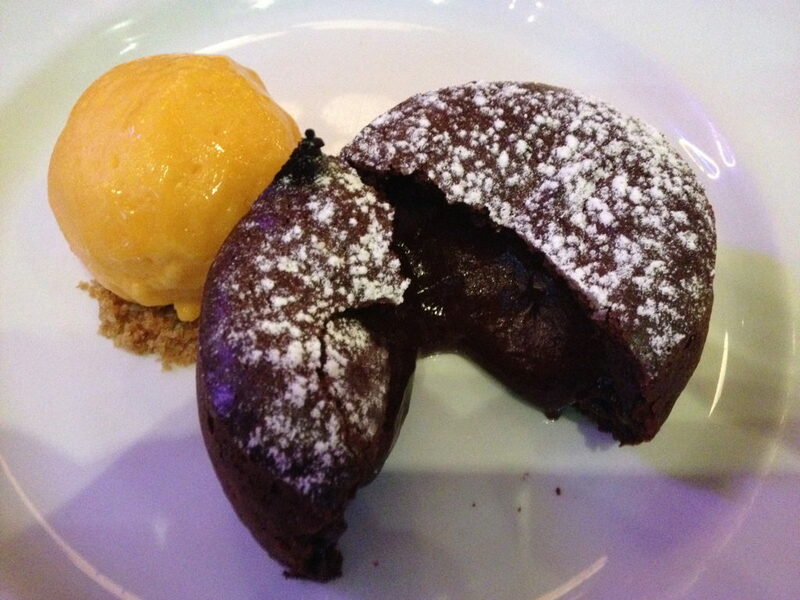 Redemption was had with Amedei chocolate pudding £7.50 with its crunchy exterior and velvety rich oozy centre. It’s exactly how a fondant should be. 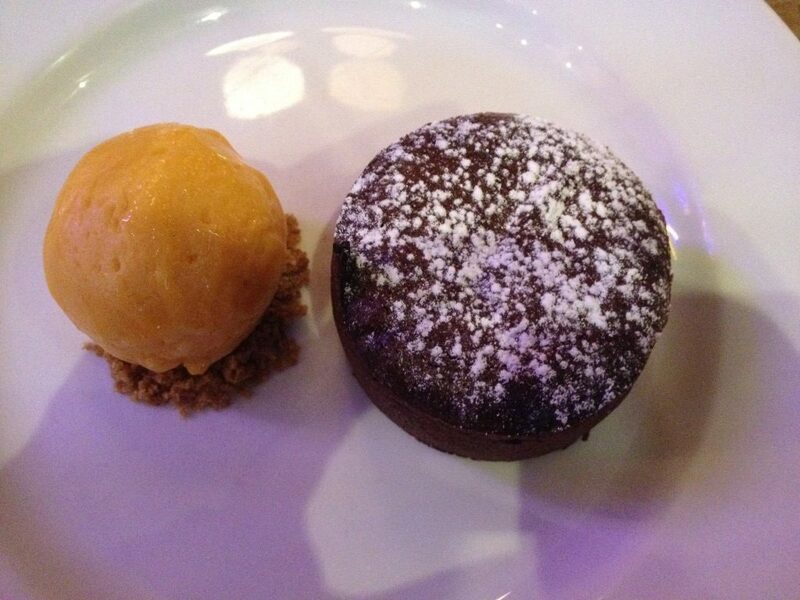 The decadence was balanced with the citric thrust from the sea buckthorn sorbet. 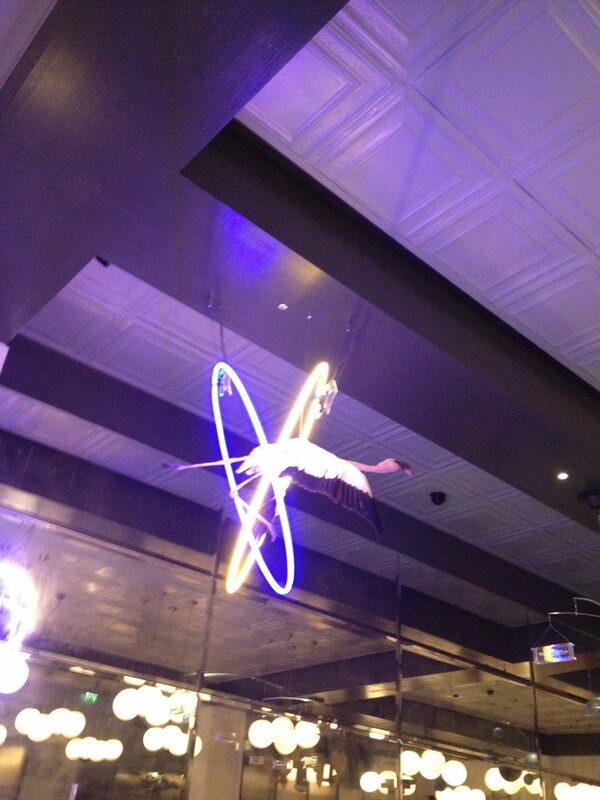 The good: It’s a great place to splash the cash and do it in style and be pretentious. 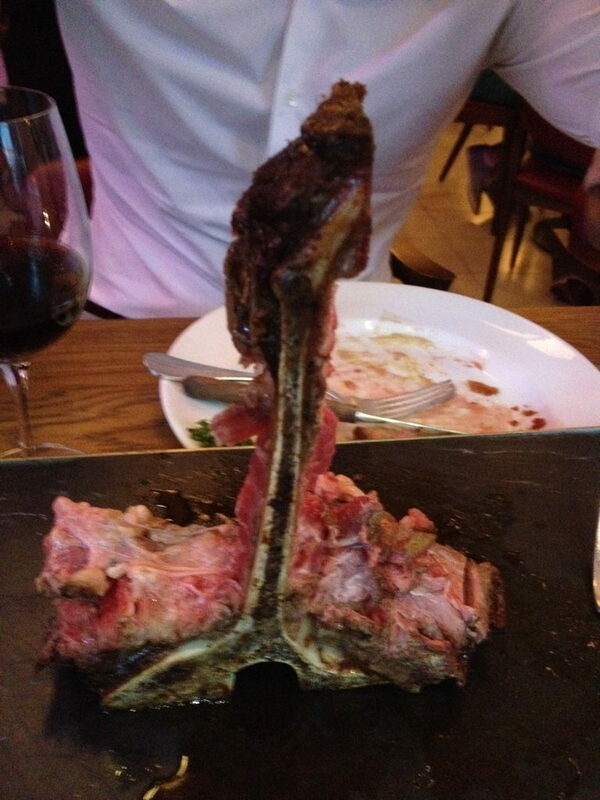 The steak was stand out as was the chocolate pudding. 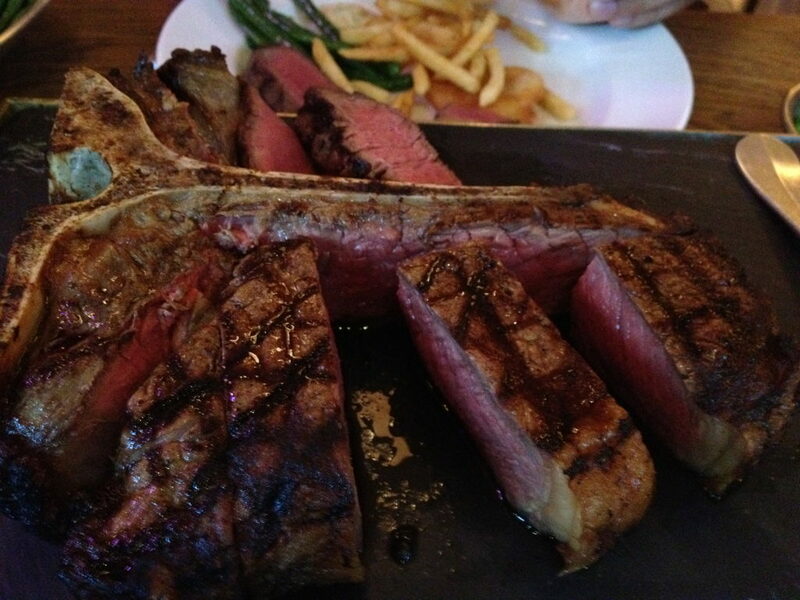 The bad: There’s better steak-led restautants out there.